I'm definitely struggling on the European beer challenge and once I can source some beers from some of the remaining countries it will return. If you can help with any of the remaining coutries please email me or comment below. Anyway, this is an Imperial IPA and it has a pretty good reputation. This brewery was on Friday night tasting a couple of months ago, and I was very impressed by all of the beers I sampled. This is the first time I've ever had a whole bottle, and after the ridiculously long day I've had at work I'm going to enjoy it! In answer to a question I received from Anton yesterday, when the word 'Imperial' is in the style name it just means the ABV is higher, and normally that the beer is better. The Dobbel dose pours really nicely for an IPA, which are notoriously difficult to pour. The beer is very cloudy and strangely for an IPA is almost completely opaque. The beer is a nice dark orange/amber colour with a good-sized off white head. This head has excellent retention and laces the glass brilliantly, it's one of the most impressive looking IPA's I've seen! If it tastes half as good as it looks, it will be a sensational beer. At first I was really disappointed with the nose of this beer. After letting it sit for a while the only thing I could smell was alcohol, however after a quick swirl the beer smells alot better. There a sweet malts and a really thick bready smell, that help offset the strong citrussy and herbal hop varieties. The malts are well caramelized, and have good hold throughout the mouth. Alcohol is still present in the aroma but with some swirling it is not as prevelent. 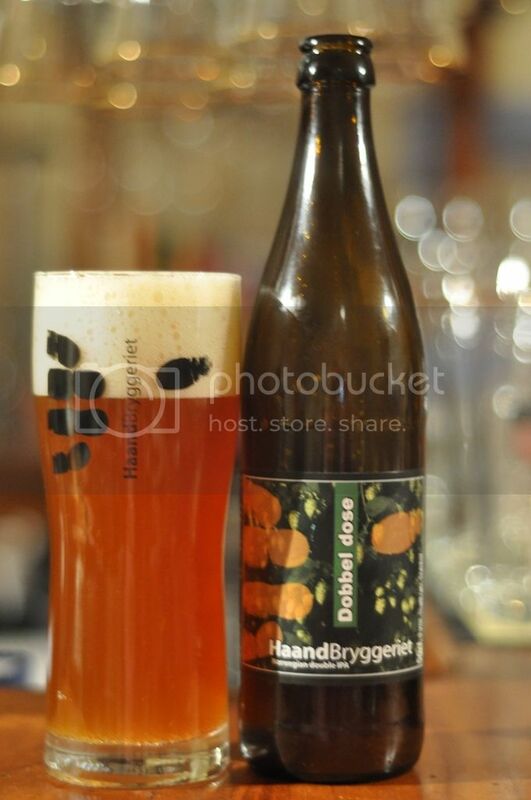 I'm quite impressed with the flavour of the HaandBryggeriet Dobbel dose, to give the beer it's full name, however the alcohol smell that was prominent on the nose is again prominent in the taste, and for mine destroys the beer. It's bready with excellent hops which have both lemony coolness and warming spicyness. I get hints of both pear and peaches, but I was slightly disappointed by a distinct lack of strong caramel malts that the nose promised. The beer has excellent warming qualities. It's a really good Imperial IPA, however the alcohol is too prominent for my liking. Yes it gives a nice warming sensation, but in my mind it destroys the overall compilation of the beer. The beers flavour are excellent and if you are one of those people who doesn't mind a strong taste of alcohol in their IPA's this is a sensational beer for you. This would make a lovely winter beer but it's definitely not a beer that the average beer drinker should try, I don't think it will appeal at all. Don't get me wrong the flavours are good, it's just the alcohol that in my opinion really weakens the overall makeup of the beer.